A few years ago, Amy and I were in the kitchen, trying to come up with a healthier chocolate chip cookie. Since we love food, we do this sometimes – we open the cupboards and try to think outside the box. Why? Because an important part of eating healthier is learning new ways to cook. I thought that sounded crazy. I mean, beans in dessert? But on second thought, however, it didn’t seen so far fetched. Most white beans – chickpeas, navy beans, white northern – have a surprisingly mild flavor. We tend to add them to savory dishes, but they actually just serve as a nice base for other flavors – like in this Chocolate Banana Shake. And they’re also high in fiber, giving them natural thickening properties. We started thinking through the baking science and realized that beans mixed with eggs might mean we could make an entire cookie without flour. The beans could stand in for all that gluten-packed refined stuff. So, out came the high-speed blender. We tossed a variety of whole food ingredients together and blended them into a batter. And no, we didn’t make cookies. Our initial attempt wasn’t thick enough to stand together on a cookie sheet. But still, the batter tasted awesome because it was sweetened with raw honey and had a hint of vanilla. We weren’t about to call this a fail. 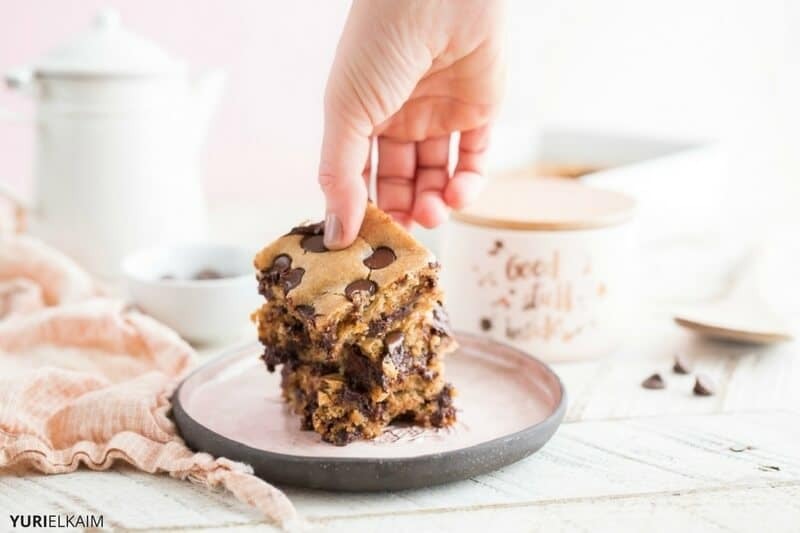 We poured the batter into a cake pan and tossed in some chocolate chips. 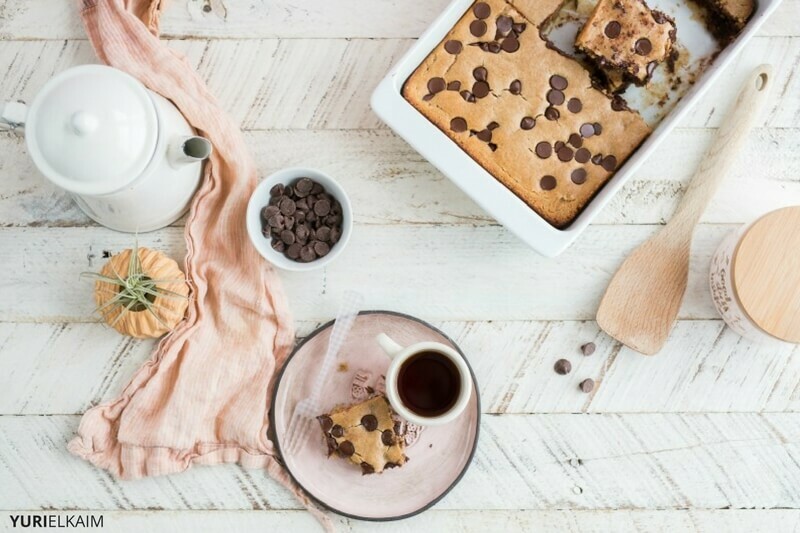 And 30 minutes later, we pulled out our first-ever pan of gluten-free, high-protein vegan blondies. 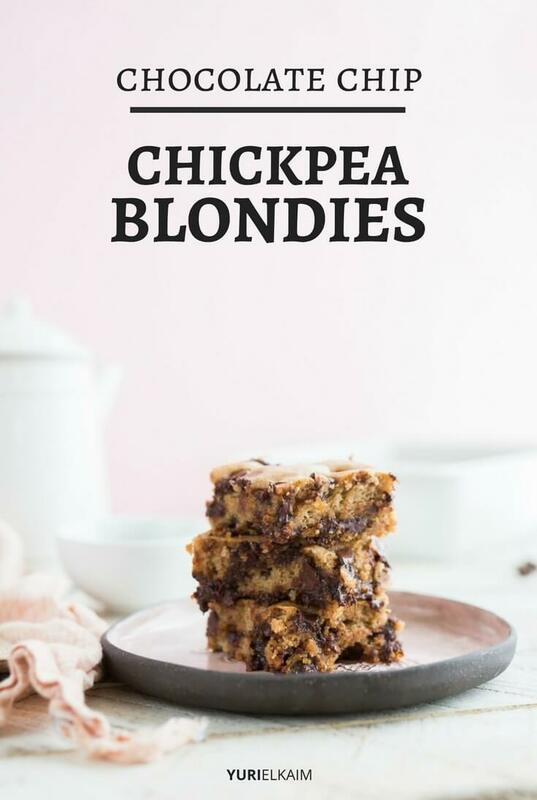 It turns out that chickpeas work fantastically as a flour swap. Which is a nice surprise, considering that every ingredient in this recipe gets a thumbs up from our resident nutritionist (that’s me) and the taste-testing staff (that’s the kids). Mix together and allow to gel for 10-15 minutes before adding to batter. These high-protein, chocolate chip chickpea blondies make decadent treats, but they are nutritious enough to eat for breakfast, too. 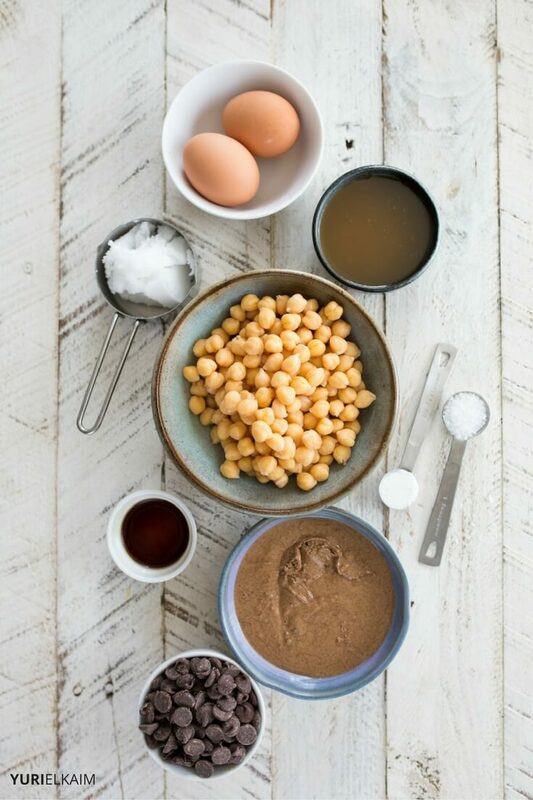 In a blender, combine chickpeas, eggs, coconut oil and honey. Blend until pureed. Add almond butter, vanilla, salt and baking powder. Stir in chocolate chips. Spread into a 8"x11" or 9"x9" pan, sprayed with nonstick coconut oil spray. Bake for 30-35 minutes, or until the center is set, and springs back when touched gently. If you want to make the vegan option for this recipe, instead of using an egg, mix 2 tbsp of flaxseed meal with 5 tbsp of water. Allow the mixture to gel for 10 to 15 minutes before adding to the batter. Yes, it really is possible to make a delicious dessert that’s low in sugar, allergens and is free of dairy and gluten. For real! Still not sure? Down my Healthy Desserts eBook and see for yourself! This cookbook contains recipes 8 sweet treats that you’ll make again and again.